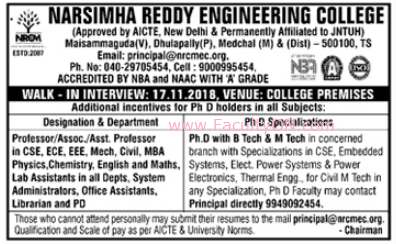 Narsimha Reddy Engineering College, Medchal has advertised in the DECCAN CHRONICLE newspaper for recruitment of Professor / Associate Professor / Assistant Professor Plus Non-Faculty jobs vacancies. Interested and eligible job aspirants are requested to walk-in on 17th November 2018. Check out further more details below. About College: CMR Group of Institutions is one of the premier educational institutions dedicated to impart quality education and promoting excellence in academic pursuits in the filed of Science, Pharmacy, Engineering and Technology and Management. How to Apply: Interested and eligible candidates are requested to attend the Walk-in interview along with CV, all originals & copies of certificates, Aadhaar card, PAN card, JNTUH Faculty Registration Form and recent passport size photos to the walk-in address provided below. Professors can contact through phone number given below. Those who can't attend the Walk-in, may send CV to the email address mentioned below.